The main interest of this location is the ability to observe important aspects of the structure and sedimentation south of the Pyrenees. Queralt combines three tectonic units: the Ebro basin, Cadí thrust sheet and lower Pedraforca thrust sheet. 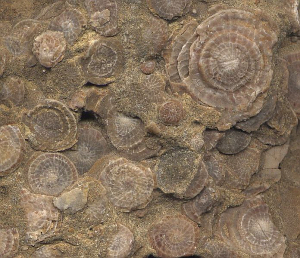 Foraminifera fossils are found in the Queralt conglomerates. The ease of access, the outstanding panoramic views and the availability of a range of different teaching levels (elementary to university) makes Queralt an ideal location for geology field studies. View from the Sanctuary of Queralt showing the anticlinal folds of the lower Pedraforca thrust sheet. The Serra de Queralt mountains rise abruptly above the subdued lowlands of the Ebro basin to the south. The highest peak is Cap de la Tartanera, 1426 metres. The monastery of Santa Maria de Queralt, 1150 metres, is located above the town of Berga. The River Demetge has cut a gorge through the mountain range. The predominant land use is forestry. The Serra de Queralt has PEIN designation making it a protected space of natural interest. The Queralt relief corresponds to the front of the Pyrenees thrust sheets with the mountains rising above the Ebro basin lowlands. The Cadí and lower Pedraforca thrust sheets overlap with outcrops of the Cadí revealing layers of marl with middle Eocene sandstones and conglomerates. The Pedraforca lower thrust sheet is composed of Cretaceous limestone, Garumnià and some Early Eocene materials. The sanctuary of Queralt is very well known to the general public, geologists and schools. The ease of access by coach and the magnificent panoramic views have made it one of the most popular places for geology field excursions. Teaching concepts can be applied at many different levels, from elementary to university. An itinerary from the junction of the Sant Llorenç de Morunys road allows the three tectonic units to be recognised: the Ebro basin, Cadí thrust sheet and lower Pedraforca thrust sheet. The overlapping Vallfogona structure can be seen on the same road. The conglomerate unconformities are also very visible, containing fossil nummulites. The Serra de Queralt is the first of the Pyrenees mountain ranges that stands out above the Ebro basin. This corresponds to the front of the overlapping units in the south Pyrenees. The highest tectonic unit to the north is the lower Pedraforca thrust belt. Its Keuper base acts as a level of separation. Above is a series of Jurassic and carbonated Late Cretaceous (Maastrichtian). Above the marine material is a Garumnià continental series with red clay, sandstone and lake limestones accompanied by a reduced number of fossilized remains and conglomerates. There is a progressive unconformity associated with the last tectonic movements of the lower Pedraforca thrust belt. The next unit, lower and further south, is the Cadí thrust sheet. This consists of a series of deep lower Eocene beds with a narrow band of marl alternating with sandstones, above which are Queralt conglomerates. The southernmost unit, the Ebro basin, is formed of a series of Eocene and Oligocene deposits. The contact between the Ebro basin and allochthonous units is through the Vallfogona overlap, an EW structure which stretches from Solsona to Garrotxa containing the fossilized remains of Oligocene conglomerates. The Queralt series is low (400 m) and begins on the Garumnià red clays. The base is limestone with nummulites and detrital limestones. Then begins a series of carbonated sediments with detrital alveolines that gradually change to a more coarse level of conglomerates created from the dismantling of the nearby relief. These conglomerates have nummulites and other fossils present in the matrix. The main geological processes in Queralt are the sedimentation of material from the Early Eocene, while undergoing active tectonic compression. The result is a sedimentary 'Growth Strata', which forms a progressive unconformity related with the growth of the anticlinal upper block that forms the front of the Pedraforca lower thrust sheet. There are other even more spectacular examples in Catalonia where progressive unconformity is observed, (for example Sant Llorenç de Morunys), but not where several geological aspects combine in such a small area as is the case in Queralt. The Sanctuary of Queralt dates from the 18th century and is built in a Renaissance style. A Fold and thrust belt is a series of mountainous foothills, adjacent to an orogenic belt, that form due to compression. Fold-thrust belts commonly form in the forelands adjacent to major orogens as deformation propagates outwards. Fold and thrust belts usually comprise both folds and thrust faults, commonly interrelated. A thrust fault is a type of fault, or break in the Earth's crust across which there has been relative movement, in which rocks of lower stratigraphic position are pushed up and over higher strata. They are often recognized because they place older rocks above younger. Thrust faults are the result of compressional forces. Dying planktonic foraminifera (marine microorganisms) continuously rain down on the sea floor in vast numbers, their mineralized shells preserved as fossils in the accumulating sediment. A nummulite is a type of foraminifera characterized by its numerous coils, subdivided by septa into chambers.